2019 marks the 150th anniversary of the first periodic table of elements, and to celebrate Imperial has been taking part in ChemFest – a series of events across South Kensington institutions including the Science Museum, the V&A, the Royal College of Art, the Royal Commission for the Exhibition of 1851, the Royal Albert Hall and the Royal Society of Chemistry. 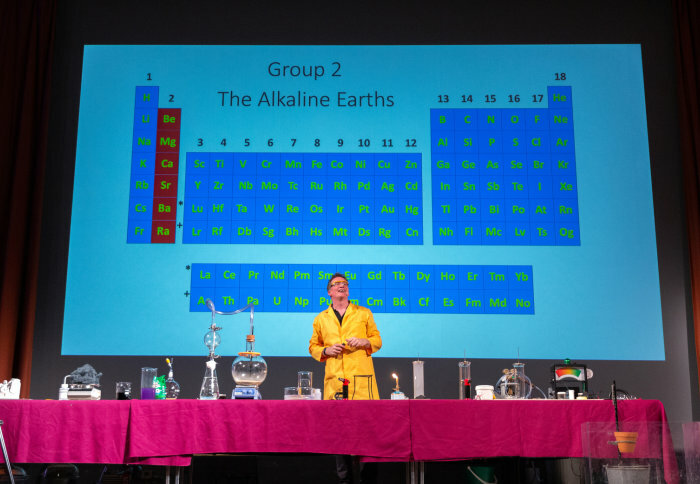 Events at Imperial kicked off with a lecture by Dr Peter Wothers from the University of Cambridge, who took kids and gleeful adults alike on a whirlwind tour of the periodic table and how it was worked out. Early published lists of ‘the elements’ tried to pinpoint substances that could not be broken down any further – through burning or breaking they were as simple as they could be. However, many of these were in fact compounds of elements combined with oxygen as they burnt in air. How the elements combined with oxygen however was crucial information used to define and classify them – eventually into the periodic table. Dr Wother’s demonstrated how many of the elements reacted with oxygen – often explosively. Imperial’s Department of Chemistry has its roots all the way back in 1845, and its illustrious history featured heavily in the Chemistry in Albertopolis conference. Albertopolis is the nickname given to the area purchased by a Commission directed by Prince Albert, from the profits of the Great Exhibition in 1851, which includes Imperial and many of its neighbouring scientific and cultural institutions. The conference was hosted by the Science Museum, and guests were treated to tours of some of the oldest labs at Imperial and to tales of Nobel Prize-winners, wartime researchers and pioneering women . Imperial’s President Professor Alice Gast and Science Museum Group Chair Dame Mary Archer opened and closed the conference, praising Prince Albert’s vision. Professor Gast said: “Prince Albert proposed that this land and the institutions he foresaw should be interdisciplinary and multinational. “Today Imperial College London is proudly listed as the most innovative university in the UK. We have multitudes of cross-disciplinary research and teaching programmes building upon the great strengths of our disciplines. Professor Gast and Dame Mary were back the next morning, joined by the Mayor of London Sadiq Khan , to welcome the next chapter of chemistry and the next chapter of Imperial – the opening of the Molecular Sciences Research Hub (MSRH). The new Hub will support innovative molecular-based science and engineering – from chemistry through to its interfaces with materials and biology – with a focus on six core research themes: chemical biology and healthcare; energy; environmental and green chemistry; imaging, sensing and analytical chemistry; materials and molecular design; and synthesis and catalysis. An opening ceremony was followed by the Chemistry 2040 conference, exploring how chemistry can help meet societal challenges like healthy ageing, climate change and food security, and how the discipline itself could develop in coming decades. Professor Mimi Hii , who leads the Rapid Online Analysis of Reactions lab, envisioned a future where data-based chemistry has allowed us to produce and recycle materials on-demand – a revolution that begins with the automation of reactions and their analysis led by a new generation of data-minded chemists. Dr Kim Jelfs imagined big data helping future chemists easily discover and create new materials, while Dr Andreas Kafizas saw solar energy technologies maturing to the stage where households and business created and stored their own energy, using the surplus to create hydrogen fuels. Dr Yuval Elani showed how his and colleagues' work could lead to artificial cells roaming and repairing our bodies, or being used in self-healing materials. Panel sessions then explored innovation in chemistry, the global challenge of food security, and the chemistry of healthy ageing, before finishing with a keynote by Dr Darlene Solomon from Agilent Technologies, a partner in the MSRH's Agilent Measurement Suite , who also participated in a 'fireside chat' about the megatrends shaping chemistry with Head of Department Professor Alan Armstrong .